Bluetooth Low Energy Beacons are able to transmit web addresses wirelessly to smartphones. The URLs have to be in Eddystone format. This page helps to convert the URLs. Bluetooth 4.0 Low Energy (BLE) aka Bluetooth Smart allows to transmit so-called advertising frames. Corresponding devices (Beacons) send these frames (or packets) permanently, so that they are readable for all nearby receivers, for example a smartphone. The frames may also carry user data, however their length is limited to 31 bytes. Google specifies under its Physical Web project a special form of user data, that transports a URL in the Eddystone format. Enter the URL into the form! The length of the encoded URL is limited to 17 bytes, so that the use of URL-shorteners, like goo.gl, is recommended. The tool produces the result as uint8_t array that contains the complete advertising data including the Eddystone service Id. To receive and test the Eddystone frames you may use, for example, a smartphone with Android 4.4 or higher and a corresponding app. The figures below show the reception of a Eddystone URL with the Physical Web application (left) and the nRF Master Control panel of Nordic Semiconductor (right). 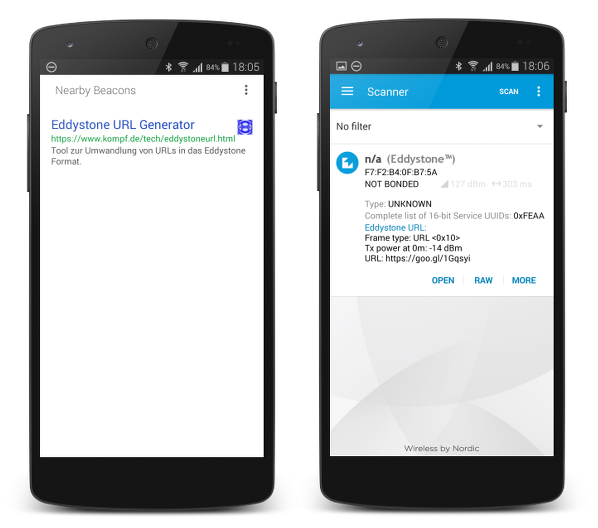 The Physical Web application accesses the encoded URL when receiving a Eddystone frame and displays title and description of the respective website. When you touch the entry, then the web page is opened in the browser. The app is probably intended for end users. The nRF Master Control Panel on the other hand provides detailed technical parameters of the Beacon, including the measured field strength in dBm. This value is useful for the experimental determination of the transmission power. For this purpose one measures the field strength at a distance of 1 m and adds 41 dBm to it. (41 dBm is the signal loss that occurs over 1 meter.) The app can also handle advertising frames in many different formats, such as iBeacon or RFduino. It is therefore a very useful tool for developers of applications for Bluetooth beacons.